Plus, it seems to me like the entire summer should be called National Strawberry Season. Strawberries are one of those foods that just scream summer. When I think of strawberries and summer, I think of a refreshing poolside snack, sweet strawberry ice cream, and the edible red stripes on the American flag of a Fourth of July dessert. And now, after this recipe, I think…applesauce! 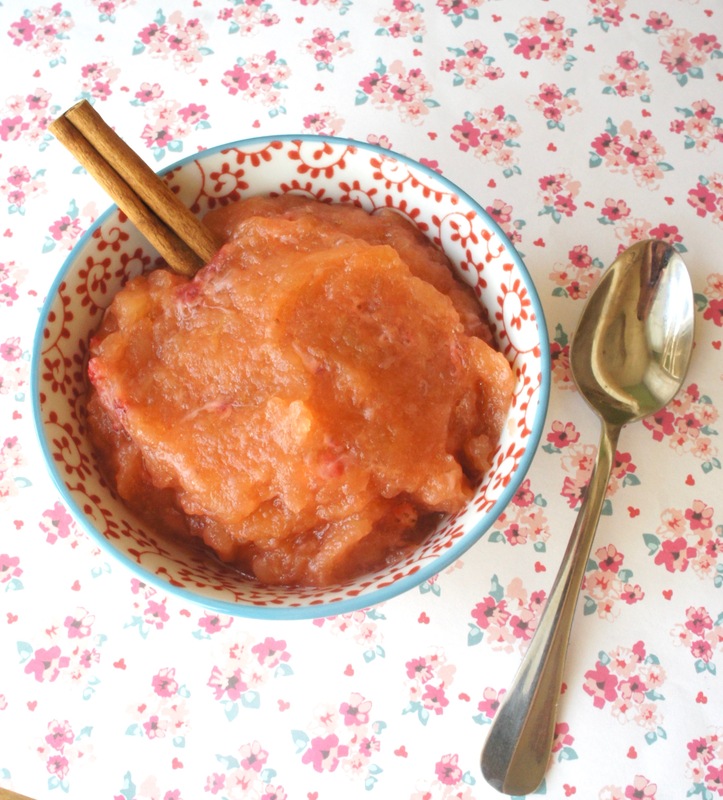 Incorporating strawberries into applesauce is a great way to use up those last loner berries you got on mega summer sale that have faded from their grocery store beauty contest-best and are a wee bit too mushy to be featured in your attractive strawberry dessert. After all, in applesauce, everything is supposed to be mushy and mixed! It’s like the meatloaf of snacks. P.S. For more strawberry fun, read my 10 Things You Didn’t Know About Strawberries post! An easy, refreshing spin on the snack classic! In a large pot, bring apples, water, and cinnamon stick to a boil over high heat, then reduce heat to medium-low and simmer until apples are tender, about 15 minutes. Mash until chunky. Add strawberries and cook another 5 minutes. Remove cinnamon stick. Using an immersion blender, puree until the mixture reaches a consistency you like. Remove from heat and stir in sugar to taste. This entry was posted in Recipes and tagged Gluten Free, Snacks, Vegan. Bookmark the permalink.